The Skat UCAV was revealed in 2007 by the MiG bureau, but has not been seen in public since then. The object was also detected by ATC radar, flying at 270 knots and nearly 7,000 feet. Approaching the L-29s from the rear, it might have flown into them if not for the controller warning the pilots. The object proceeded in the direction of Penza and disappeared from the radar screen. The pilots’ description indicates it was a jet-powered UCAV with swept wings. In theory, it might be an old Tupolev Tu-143 Reis reconnaissance UAV or a newer Tu-300 Korshun experimental UAV made during 1990s. But local media reported that the mysterious object bore greater similarity to the Skat. The Russian defense ministry denied knowledge of the incident. Just days before the incident, defense minister Sergei Shoigu told journalists that funding of 320 billion roubles ($9 billion) for new UAV designs has been approved, with deliveries due by 2020. The Russian armed forces already operate about 500 UAVs, but “not all of them are proving up to requirements,” Shoigu said. RAC MiG exhibited the Skat UCAV at the MAKS 2007 airshow in Moscow as a full-scale mockup. The maker described it as a stealthy multipurpose UCAV intended for striking pre-located stationary targets and suppression of enemy air defense system in conditions of severe ECM and antiaircraft fire. The UCAV should be able to successfully engage hidden and heavily protected land and sea targets and conduct its operations either autonomously or as part of a larger aviation strike force made up of manned and unmanned aircraft. The Skat is powered by a single Klimov RD-5000–a non-afterburner derivative of the RD-33 powering the MiG-29 fighter–with thrust of 11,000 pounds. Its maximum takeoff weight is about ten metric tons; zero-level speed in excess of 430 knots; max speed of Mach 0.80; 40,000-foot ceiling; and range up to 2,500 miles. The weapons load is 2,000 kg (4,400 pounds), carried internally in two bays; a typical load would be two Kh-31P/A anti-radiation/anti-ship missiles or KAB500 series guided bombs. The Skat’s wingspan is 11.5m (38 feet); fuselage length, 10.25m (34 feet); and height 2.7m, (nine feet). In March 2013, the president of United Aircraft Corp. confirmed Sukhoi’s and MiG’s involvement into UCAV development. Mikhail Pogosyan said that specialists from both companies were working on shaping such a vehicle and formulating requirements. 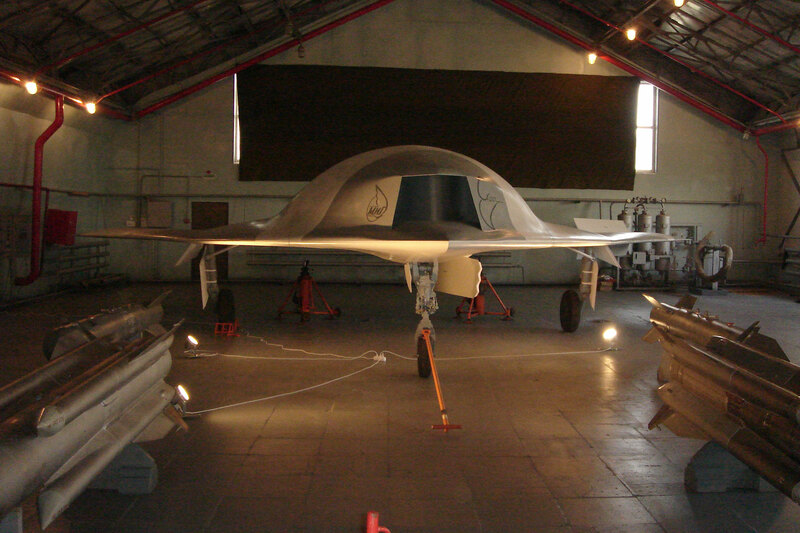 About the same time, the defense ministry announced that Sukhoi had been selected to lead the R&D on a heavyweight UCAV that would become available in 2018 to 2020, whereas Transas and Sokol had won contracts for a smaller UAV weighing up to five metric tons to be ready in 2015 to 2016. But in a very interesting development in May 2013, RAC MiG won a separate contract from Russia’s ministry for industry and trade to carry out a R&D work on development of a future UCAV. “The experience we gained in frame of the Skat effort provides the base for new designs which the MiG’s Engineering Center is doing,” Korotkov commented at the time.